You love your dog and want to keep him or her happy and healthy. But have you bought a Cool Bed III Brand Pet Bed so your pooch will have a constant cool spot in summer, relief from furnace and fireplace heat in winter, and cushiony support for vulnerable joints all year? Cool Bed is a dog bed that will keep your dog content year-round. It is non-electric, non-toxic, paw-puncture proof, and easy to clean. Fleas hate the cool environment but dogs love it. The summer months can be brutal to your dog. Dogs are much more susceptible to heatstroke than humans because they have to wear a fur coat all year long and they have no sweat glands. Dogs try to cool themselves off by panting but it's less efficient than sweating so they tend to suffer more from heat. Dogs with thick, double-coats are especially vulnerable to heatstroke as are dogs with pushed-back faces such as Bulldogs, Pugs and Boxers with smaller airways so they have less ability to blow out hot air. The Cool Bed is an excellent antidote. Use it indoors, outside (away from direct sunlight), and in the crate for traveling. Eases heat discomfort, joint problems, skin disorders, hip problems and more. Not only does the Cool Bed III provide cool and comforting relief but it has helped many dogs with ailments like Cushing's Disease, Hip and Elbow Dysplasia, post surgery, post chemotherapy, and heat stroke. The Cool Bed III provides tremendous joint support which helps Hygromas and other joint problems that may occur from lying on a hard floor. 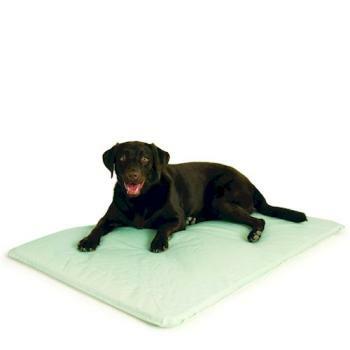 If heat is needed, you can place a heating pad underneath the Cool Bed III to provide a warm and comforting spot for your dog. Simply add the recommended amount of water through the easy fill cap and burp with the new easy air adjustment valve. The unique Cool Core diverts the liquid better than ever throughout the bed for advanced cooling power. The new nylon/vinyl exterior is tougher than ever!!! This Cool Bed III Dog Bed is 17" x 24" - for dogs up to 25 pounds.